One of the most helpful things that I’ve ever read was Adding It Up: Helping Children Learn Mathematics. In that book, there is a wonderful diagram of a rope with five interwoven strands representing components of mathematical proficiency: adaptive reasoning, strategic competence, conceptual understanding, procedural fluency and productive disposition (towards mathematics). Firmly believing that a positive disposition towards mathematics is essential for mathematical proficiency and motivation to learn, I had my students follow this prompt on the first day of (our) class: “Draw me a picture of what it looks like when you are doing math.” Here are a few of the pictures that I got. This was a very typical picture. Most of the pictures were of sad, frustrated or confused faces. This student had the most positive disposition towards math in the class. This boy's drawing is interesting in that it shows him cheating in math class. 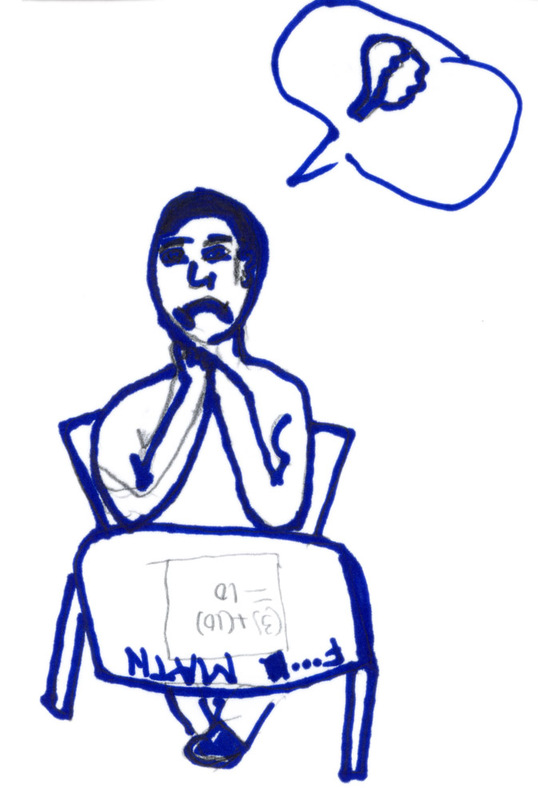 Another representative drawing: notice the table has "F...K math" written on it (with the K crossed out); it's probably not "F" as in the grade "F" as I originally thought. 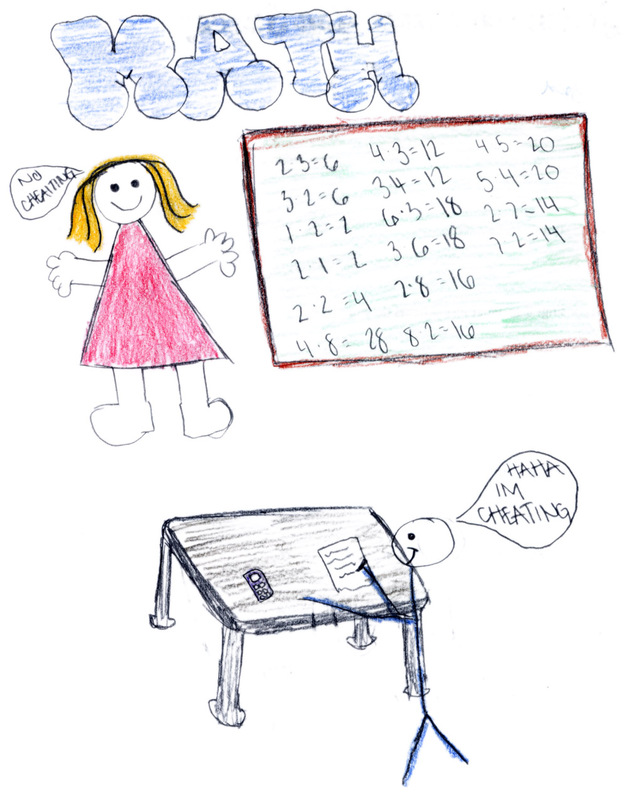 While the students laughed and tried to make light of the pictures they drew, I don’t think that all of them drew these pictures in response to dominant cultural stereotypes about mathematics. I was in a mentally prepared to see pictures like these, but I wasn’t fully prepared to believe them. I’ve been in a funk ever since I got back from school today. My heart is totally broken. Myth #1: Some people are “good at math” and some aren’t. Truth: With effort, anyone can be good at mathematics. Myth #2: Mathematics is about calculating things and following procedures. Truth: Doing mathematics involves logical reasoning, creative problem solving, collaborating with others, communicating mathematics, and much more. My hope is that by starting the first day of class with this message, students can have a better disposition towards mathematics and more efficacious beliefs about themselves and mathematics. I usually ask my student how many hate or dislike math on the first day. Then I give them a goal of dilike for those who hate and sorta kinda like for those who dilike. I tell them that it is hard to like something you aren’t good at and that with practice like anything else (enter fav sports analogy) they can learn to be better at Math. It starts with them enjoying their experience in your class. You are almost as much of a coach/cheer leader as you are a teacher now. You can do it! I have faith in you. Hey, D. The way you gotta look at it is that their art teachers failed them. And you’re gonna change that! “Okay, kids. When you draw yourself doing math, there should not be any frowny or confused faces.” Good luck!!! To me, these drawings are positive D. I see all of the messages say in sequence: hey teacher, 1) I don’t understand math, 2) please teach me, 3) I want to learn not cheat, 4) I don’t want to fail. Do you see it? Well, at least you seem to HAVE students now. That’s good news, right? Dont worry – you can help change that around! They will start trying when they know they can ask you for help and you won’t make them feel stupid. Have them do the same thing in June and see what they give you. Keep these for comparison. You will feel better. The one thing about teaching is there really is no such thing as instant gratification! The good news… (?) They have you to help them construct a better disposition and perception of mathematics. Even though their past experiences reveal feelings of anxiety, fear, and frustration, there may be an opportunity to establish some new relationships and some new ideas. Hang in there! 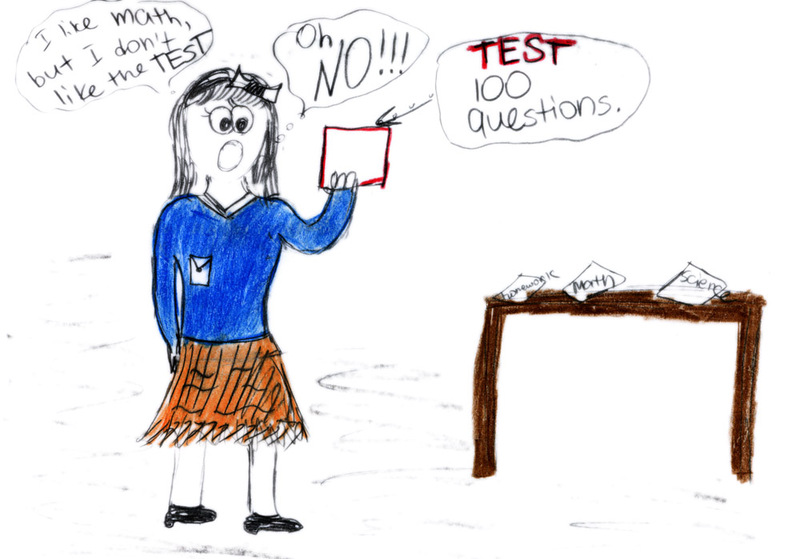 I’d be interested in some of the specific experiences the students remember that brought these feelings up: their experience with tests? not being able to follow the path of the lesson? I’m proud of you – you’re possibly the first teacher who even asked them about their feelings/attitude about math. That may do a long way to helping establish trust! Hi hi — Well, I don’t know if this makes you feel better or worse, but the one where you think there’s an F on the kid’s paper…. I think s/he wrote “F… Math”, as in “F— Math”, as in a command, not a grade (there’s even the missing “K” crossed out). In any case, I agree with Nikki’s comment — think of this as an opportunity to change their world view! If anybody can do it, I know you can!!! This is a great idea and well executed. You should ask the kids at the end of the year to draw again (and be honest about it, as they were here) to see what happened. On the plus side, the “cheating” student knows a lot about commutativity! Their 4s tables could use a little work, though. Great job. By the way, did you get students’ permission to post their pictures online? It might be a hassle but it’s a lot less than the potential backlash if there is a problem. Probably won’t matter.